The unpredictable weather of Canton has taken its toll on everyone. But when it becomes a team’s only way of training, the brisk, cold weather can make things a little more complicated. The indoor track and field team has competed all season long with weather complications. But despite the unbearable weather, the Pioneers have managed to break through the barriers. Breaking multiple school records this season, the team has made a run for its upcoming GLIAC Indoor Championship that will be held next weekend at Hillsdale College. Snow can be an issue when throwers are preparing for field events outside, especially for a team that doesn’t have a facility to actually practice its crafts. In previous years, the throwers would go to a warehouse to practice. This year they haven’t been able to use the facility but instead they found a way to practice on campus in the harsh weather. This winter has been cruel to field event participants, but it has not slowed them down from success this season. With constant support and intense competition from each other, the athletes have managed to break three records during the indoor season. Taylor is ranked 16th in the nation and 9h in the conference in the weight throw. Taylor also broke the school weight throw record. Lyndsey Bates is a junior thrower who has broken the weight throw record numerous times and even pushed the record seven feet past the previous record that she broke at first. Bates is also nationally ranked, currently in 23rd position in the weight throw and 12th in the GLIAC conference. This indoor season has been just as hard for sprinters and long distance runners. The surface is important when it comes to racing and practicing. Going back and forth on hard surfaces to soft surfaces can cause injuries. The team travels to Jackson a few days throughout the week to train in a sports bubble. When they aren’t there, they are practicing hurdles in Osborne Hall or practicing in the gym. Smith placed 3rd in the 60m at the NCAA Division II Challenge meet on February 8th. The distance team is built around many good runners who have hit national qualifying marks as well. “Realistically, our distance team has several runners who can and should place at the GLIAC meet,” Smith said. Senior Tina Oprean has set four different records for the Pioneers in the 800 meters, 1 mile, 5000 meters and the distance melody relay. Oprean hit national qualifying B standards in all events but the mile. Besides Oprean, the women’s nationally ranked distance medley also consists of juniors Madison Schuler and Emily Fisher and freshman Mackenzie Keller. On the men’s side, multiple athletes have also made a few lasting impressions hitting qualifying standards in the men’s distance melody relay and the 3000 meters. Senior Mitch Williams recently hit a national qualifying B standard in the 3000 meters in 8.33.6 at Indianapolis two weeks ago. Williams is also part of the men’s nationally ranked distance melody that also consist of senior Jarod Williams and juniors Scott Whitaker and Matt Hendrix. Both the men’s and women’s distance melody teams are ranked in the top 12 and have the chance to go to the national meet. The GLIAC meet is sure to yield an interesting outcome. The meet takes place March 1st and 2nd. 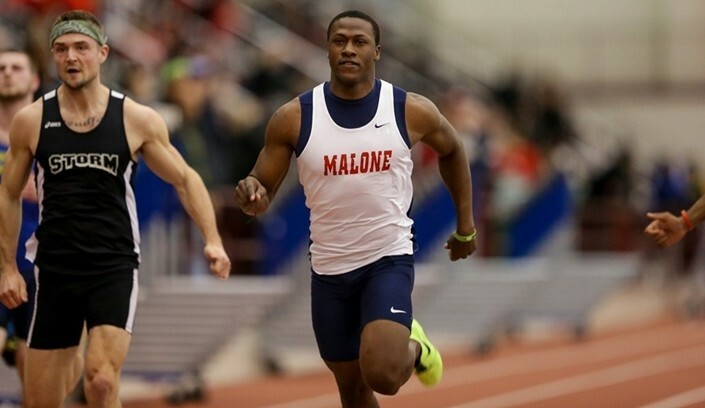 Malone has a lot of athletes who can score points in their individual races in an attempt to bring home the university’s second GLIAC title.